Now, in New Jersey, Gov. Philip D. Murphy, a Democrat, is pursuing a series of bills that would significantly expand access to the ballot for hundreds of thousands of voters. “The package of reforms in New Jersey would place the state at the forefront of the country in terms of voter access,” said Wendy R. Weiser, the director of the Democracy Program at the Brennan Center for Justice. We are encouraged by the strides made in this area in 2018 and fully support your expansion of these rights in 2019, including: 1. on-line voter registration; 2. early voting - up to 30 days before; 3. same day voter registration; 4. 17 yr. olds who will turn 18 before a general election, to be eligible to vote in the primary; 5. extend registration deadlines; 6. add state agencies offering voter registration services; and 7. lifting the voting ban of those who are on probation or on parole. Please click here to read our letter that supports Governor Murphy’s ongoing efforts to increase voter access. Then help us amplify that message and strengthen its impact by sending an email to the State Officials in the 11th District, who will have received a copy of our letter as well. Their email addresses appear below, along with a brief statement to copy, paste and send. Please email it to all three Officials and remember to add your name and address. I am a voter in the 11th district and a member of the Greater Red Bank Women’s Initiative. I support the Governor’s expanding package on voting rights as seen in our letter to the Governor which you have received a copy of. We hope that this agenda will receive your full support when brought before you. Through our ongoing fight against Gerrymandering, we have become aware of politically motivated bills before the NJ Legislature. So that the politicians who will decide this issue may hear us, a letter is going out to the Governor and other individuals. I will leave it to each of you to read the details——you can search “new bill in NJ legislature on redistricting” to find, not only information, but a myriad of prestigious groups that are vehemtly opposed to this measure. I am writing a letter to the Governor, who I believe opposes this bill, but for the wrong reasons. I will try to suggest that he take up the cause on behalf of the electorate not the politicians. This new plan will highly favor the Dems, if it moves forward, by basing districting on the last election......merely another ploy to keep those “in - in”. We did not work so hard for the “blue wave” to have them duplicate what is wrong all over the country. We can like the Dems, but need not enable them to keep the true power out of the hands of the people. I will send you a copy of the letter to the Governor in the next day or two. There are public hearings next week in Trenton....posted on the GRBWI calendar and Facebook group page. Let's pack the house and end the pre-GOTV period on a great note! We need our supporters from across the district to come bring your energy to one of our most important towns! Let's make this feel like a rally! The debate is being held by News 12 New Jersey and will take place in the News 12 studio. It's not really a debate, News 12 clarified, but more of a conversation or forum with the two candidates. It will not be airing live: The debate is being taped Wednesday at noon, but won't be seen on the air until Friday, Oct. 19 at 9 p.m., and then re-broadcast Saturday, Oct. 20 and Sunday, Oct. 21 at 10 a.m., 12:30 p.m. and 4:30 p.m. Suggested Donation is $50 yet all are welcome to attend. Note: The above link will be a donation that helps the campaign at large. 50 Day Kick-off to the Midterm Elections! Calling all family, friends, allies, and neighbors! Have you asked how you can help our campaign? Here's how! Upon arrival, volunteers will be made into teams and receive their lists and materials. Our goal: To knock doors! After canvassing and hard work, you deserve a reward. We invite you to join us for food, drinks, and fun at Neapoli on Wallace Street. We look forward to a great day with all of you! The Josh Welle for Congress campaign is looking for people to participate in a video shoot next Saturday, September 1. If you can join us, please RSVP HERE by filling this form. The Welle campaign is shooting its first official ad, and they need your help to do it! On Saturday, September 1, at the Elks Lodge in Freehold , gather for a town hall/rally for Josh. Please wear solid colors. If you have Welle shirts, bring them separately! We may use them in a shot or two! There will be snacks! There will be drinks! There will be some standing around, but it will all be for the sake of getting Josh's name out there to voters in NJ04! We are looking to get a minimum of 150 PEOPLE in the room. And please - Bring friends, bring family, bring people you know from school, and bring anyone who can match your enthusiasm for getting Josh elected to Congress on November 6th. Join Amber Gesslein and Larry Luttrell on Saturday, August 4th for their first Day of Action. We have less than 100 days until Election Day! We need your help knocking on doors or making phone calls. Sign up today to help elect Democrats on the Board of Chosen Freeholders! The Monmouth County Democrats and Ocean County Democrats invite you to our annual Campaign Training Boot Camp! We are sponsoring a full day of training for candidates, activists, campaign managers, and municipal chairs. 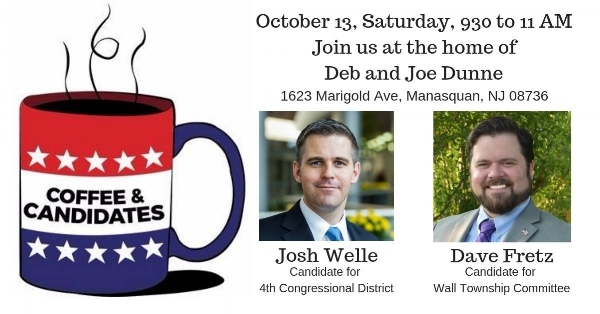 Join Josh Welle for his first town hall event, in which he will be responding to the questions and concerns of the citizens of New Jersey’s 4th Congressional District.